If you’re planning to enter the film or TV industry, you’ll want to get the Arri Alexa Classic EV. This film-style digital camera, which was released in 2010, was the first product in the Alexa range and marked Arri’s major move into digital cinematography. The Classic EV has been dubbed as “Hollywood’s Camera of Choice” and has become a favorite among many cinematographers like Emmanuel Lubezki, Phedon Papamichael, and Roger Deakins. 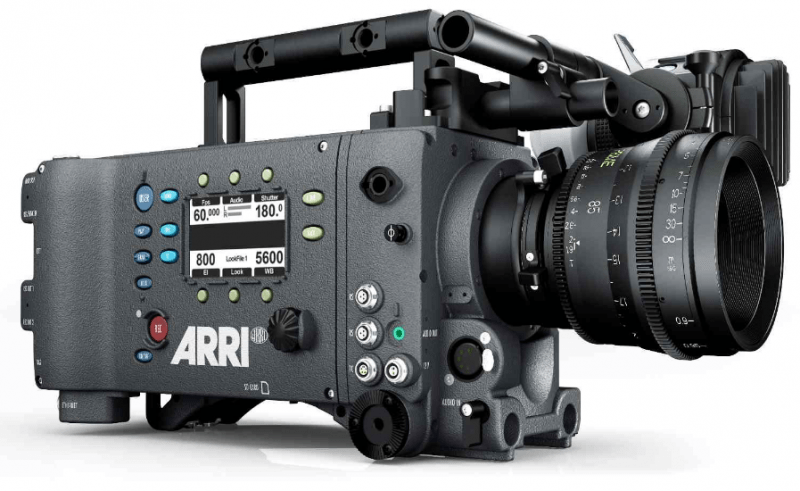 The Arri Alexa Classic EV is built with a 35 format ALEV III CMOS sensor. Rated at ISO 800 and 2.8K, it comes with 14+ exposure latitude with 7 stops of over-exposure and another 7 for underexposure. This allows the camera to have a lot of flexibility when it comes to color grading and allows it to capture more detail both in highlights and in dark areas. The camera can also record up to 60 frames per second, although there might be some limitations to this depending on the recording format and recording media used. 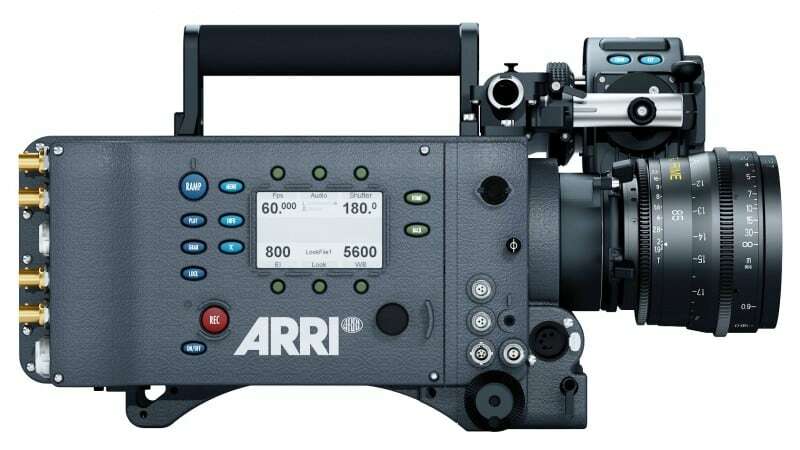 In terms of recording outputs, the camera can produce both HD-SDI video and Arri’s proprietary raw files called ARRIRAW, which contains both static and dynamic metadata. Its excellent image quality gives you the flexibility to up-sample or down-sample the final product to HD, 2K, or even 4K resolution. Another great thing about the Arri Alexa Classic EV is its electronic color viewfinder, which is named the ARRI EVF-1. It’s built with ARRI LED illumination and 1280 x 784 F-LCOS micro display, paving the way to excellent image quality and accurate color reproduction. It also comes with a high-speed connection between the viewfinder and the camera itself, allowing you to enjoy fast, low-latency image display and ensuring you can see the action in the viewfinder at the same moment it happens in front of the camera. The powerful sensor and other components generate a substantial amount of heat, but the camera is designed to handle it properly. It comes with a slow-running fan that keeps the radiator cool, while pipes transport heat to a ventilation shaft at the camera’s back. This system protects the camera’s sensor and processing boards and prevents overheating even during the hottest days and in the warmest climates. One of the best things about the Alexa Classic EV is that it’s designed to withstand wear and tear. Its rugged construction can take almost any beating that daily life can throw at it, while its electronics are effectively sealed and protected from dust and splashes of water. It’s a great camera to have if you’re shooting outdoors in rough locations. With a built-in shoulder cut-out, the camera can snugly settle on your shoulder and accommodate its natural arch. It also comes with an adjustable finder so you can set the eyepiece to a comfortable position when you’re using the camera for shoulder operation. 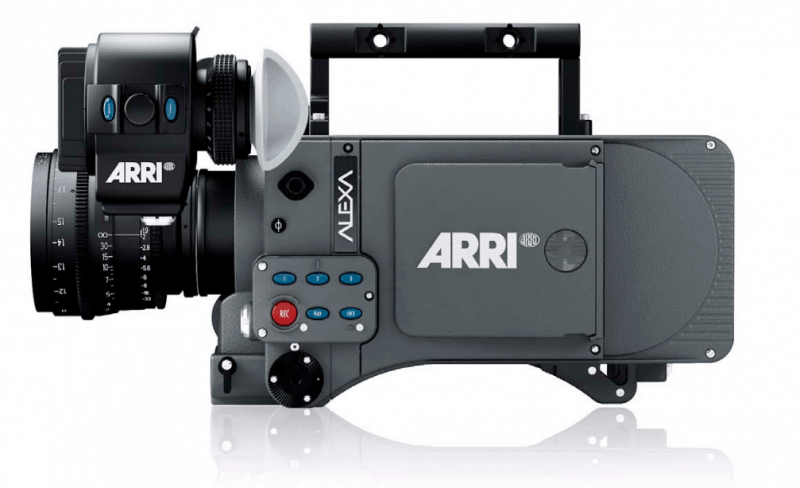 Arri built the Alexa Classic EV in a way that it can roll with the times. Its design allows you to choose from a range of modules and choose one that best suits your filming needs. As a result, your camera stays relevant and won’t need an upgrade for the years to come. A lot of people want to enter the film and TV industry but are hesitant to do so because of the complexity of the equipment involved. If you feel the same way, there’s no need to fret since the Arri Alexa Classic EV has a simple, intuitive design. With just a few hours of tutorials, you’ll master the basics and learn how to operate it like a pro. The Arri Alexa Classic EV is more expensive than ordinary camcorders, making it too expensive for the average consumer. However, this isn’t really surprising since the camera is built for professional cinematographers who take their job seriously and want to invest in the best possible equipment. With its body and PL mount, the camera weighs 13.9 lbs (or 6.3 kg). If you combine the electronic viewfinder plus its cable and handle, it reaches 16.9 lbs (or 7.7 kg). This would definitely feel heavy on your shoulder, but it’s a small price to pay for the camera’s excellent features. The Arri Alexa Classic EV offers a lot of useful features to film makers. If you’re serious about cinematography, you won’t go wrong with choosing this camera. Filters Permanent filters in front of the sensor: optical low pass, UV, IR. The lens mount can be upgraded to accept ARRI Full Spectrum Neutral Density (FSND) filters. Values behind the exposure index are the number of stops above and below 18% grey. Sound Level Under 20 db(A) while recording ProRes 4444 16:9 HD @ 24 fps and ≤ +30° Celsius (≤ +86° Fahrenheit) with lens attached and fan mode set to ‘Regular’, measured 1 m/3 feet in front of the lens. Silent operation at higher temperatures possible with fan mode set to ‘Rec low’. Power In Three possible inputs: BAT connector, optional battery adapter back or optional battery adapter top. All inputs accept 10.5 to 34 V DC. Approx. 85 W power draw for camera and EVF-1 in typical use recording ProRes at 24 fps to an SxS PRO card at room temperature, without accessories. Initial power draw during power up is higher. Weight ALEXA body with PL mount: 6.3 Kg/13.9 lbs. ALEXA body with PL mount, electronic viewfinder, viewfinder cable and handle: 7.7 Kg/16.9 lbs. Lens Mount 54 mm stainless steel PL mount, Super 35 centered. 52.00 mm nominal flange focal depth. Assistive Displays For EVF-1 and MON OUT: preset and custom frame lines, user rectangles, surround view, 180º image rotation, camera status, false color exposure check, peaking focus check, compare stored image with live image, RETURN IN video and optional anamorphic de-squeeze (license key required). For MON OUT additionally: Reel & clip number. Control Camera right: Main user interface with a 3” transflective 400 x 240 pixel LCD color screen, illuminated buttons, button lock and jog wheel. Camera left: Operator interface with illuminated buttons and button lock. Camera acts as a web server, displaying the ALEXA Web Remote on web browsers of computers connected to ETHERNET connector. Optional accessory Remote Control Unit RCU-4 for cabled remote control via camera ETHERNET connector. Optional accessory Wireless Compact Unit WCU-4 for wireless remote control (UMC-3A or UMC-4 required). In-camera Recording QuickTime/ProRes or MXF/DNxHD recording onto one or two (Dual Recording) SxS PRO or SxS PRO+ cards. All formats include embedded audio, timecode and metadata. Recording Outputs 2x 1.5G or 3G REC OUT BNC connectors for ARRIRAW T-Link or HD-SDI video. Both with embedded audio, timecode, metadata and recording flag. Image Processing 16 bit linear internal image processing in full ALEXA Wide Gamut/Log C color space. Target output color spaces for ProRes, DNxHD, REC OUT and MON OUT: Log C or Rec 709. For Rec 709, a customized look can be applied during record and playback with ARRI Look Files. Optional horizontal image mirroring. Synchronization Master/Slave mode for precision sync of settings, sensor, processing, HD-SDI outputs and in-camera QuickTime/ProRes or MXF/DNxHD recording for 3D applications. PHASE user button for shifting camera phase to move phase artifacts out of frame, i.e. when shooting a CRT monitor or rear screen projector (works in Rec Run TC mode). Playback Playback of ProRes or DNxHD from SxS PRO or SxS PRO+ cards visible on EVF-1, MON OUT and REC OUT. Playback audio available over headphone jack and embedded in the MON OUT and REC OUT signal. Audio 1x XLR 5 pin AUDIO IN for 2 channel, line level, balanced audio. 24 bit/48 kHz A/D conversion. Uncompressed PCM audio recording to ARRIRAW, ProRes, DNxHD and embedded in all HD-SDI outputs. Only available with same project/sensor speed at 23.976, 24, 25, 29.97 and 30 fps. Max of 2.5 dBm output from AUDIO OUT headphones connector. BNC connectors designed for fast exchange without camera disassembly have been used for ALEXA since approximately mid 2012. These connectors require a special tool (ALEXA Plus BNC Removal Tool, K5.72915.0). SD Card For importing and storing ARRI Look Files, camera set up files, frame line files, feature license keys and user pixel masks. Stores frame grabs from the REC OUT image path in ARRIRAW (.ari, 12 bit), TIFF (.tif, 16 bit), DPX (.dpx, 10 bit) or JPEG (.jpg, 8 bit) format (1). Stores log files. Also used for installing Software Update Packets (SUPs). Upgrades The Storage Interface Module (SxS Module) can be exchanged for future storage modules (i.e. XR Module). The Electronics Interface Module can be exchanged for future control electronics (i.e. Plus upgrade). An easily exchangeable lens mount allows other lenses beyond PL mount lenses to be used. The lens mount can be upgraded to accept ARRI Full Spectrum Neutral Density (FSND) filters. Simple camera software updates via free-of-charge Software Update Packets (SUPs) and payable license keys – Anamorphic De-squeeze, High Speed and DNxHD. Note:Technical data based on Software Update Packet SUP 11.0 (ALEXA Classic).